"You mustn't be afraid to dream a little bigger." 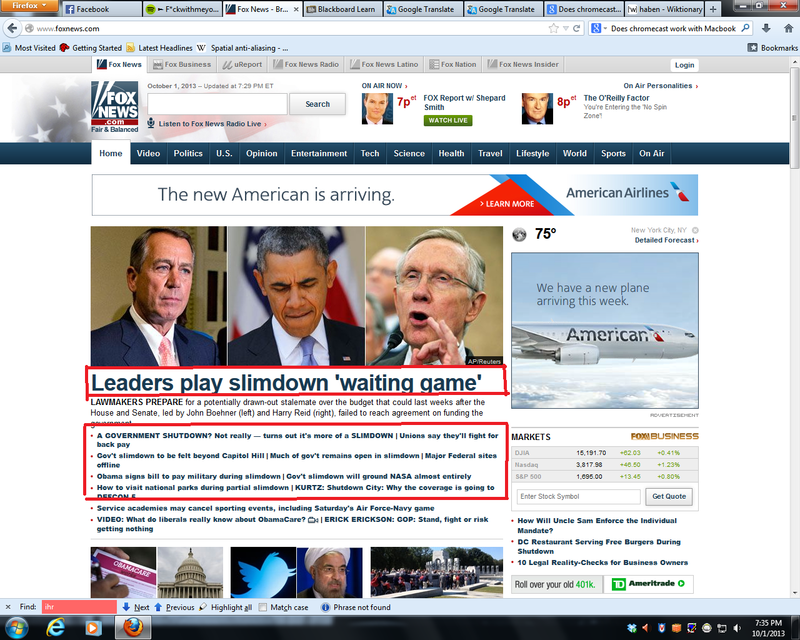 While on my Twitter account today, I noticed a number of Republican politicians that I followed began referring to the Government Shutdown over the Affordable Care Act implementation as a ‘Slowdown’ instead of ‘Shutdown.’ I thought this was strange, so I went to FoxNews.com and saw the same verbiage. File this under the ‘Things that make you say hmm’ category, while it also appears as further inarguable evidence of Fox’s ties to the ultra-conservative movement. Here’s a rambling email I sent to Steve Ballmer in 2008 & His Response. doing now with merging the Windows 8, W Phone 8, and Xbox One platforms works out , I guess I’ll have to take all credit for it. Anyway, pretty interesting dig up. Also love or hate Ballmer, pretty cool that he / someone emailed back a rambling 15 year old. Microsoft as well as the industries it is involved in are in a period of change. Online, Google has been trouncing Microsoft. Starting with the Zune, although being a fantastic and superior device to the iPod by Apple, a limited marketing campaign has yielded little public recognition of the device. Your efforts in the Marketplace, making many songs mp3 format, is really a fantastic motive that will force other companies to reconsider their positions. The XBOX 360 is a respectable gaming platform that has a wide range of games that lead to the much publicized games per console ratio that is unparalleled in the industry. However, its price point of $449.99 for the top model compared to $399.99 for a 40GB Blu-ray equipped PS3 makes me wonder what is the advantage? Although Microsoft has spoken of its intent to create an online movie distribution partnership (Through netflix presumably) currently your offerings are at best poultry, and many people are buying the PS3 based on its Blu-Ray capabilities. Microsoft seems blind to the fact that these two services would be absolutely incredible if they were combined. It would be a marketplace that offers music, video, downloadable games perhaps, and any other service you could dream up. Creating this for a universal platform would yield a tremendous jump in usage and position Microsoft better in many of the industries that it is currently fighting in. It seems almost as though each unit fights its own battle. If Microsoft would collaborate its services into one then it would be much more efficient. Speaking of efficiency, I fail to understand what the Yahoo deal brings to Microsoft. The center of the issue is Microsoft’s failure to capture market share from rival Google. Why is this? Well from the standpoint of a consumer that uses both, Google is much more efficient. On the mobile platform, Live search is terrible and hardly functions well compared to a snappy and quick performing Google mobile search. History has shown the affects of when 2 companies with different coporate environments try to combine (AOL and Time Warner), and we have also seen the devastating effects that has on the value of the company. Microsoft does not need Yahoo. It needs interoperability. There is so much that can be done with Live Search that is not being done. Take for example the other night, when I was looking for the BioShock demo on XBOX live. There is no search function there, I had to scroll through every demo alphabetically until I found it. Why doesn’t Microsoft add a search tool there to help the user find things more quickly, and efficiently? Microsoft needs to work hard to establish itself in the Online Market, and that comes from bundling Live search with new computers being sold, and IE 7 downloads. This is what Google has done and become very successful from. Although most of this has seemed negative, I must applaud recent efforts by Microsoft. It is fantastic that Microsoft have realized that it is necessary to reduce the footprint of Windows 9 to make it run efficiently; this is one of the main selling points of Apple, even if it is a fallacy or not. I am sure with a few modifications to how Live search works, how its marketed, and how its implemented, that Microsoft can sit firmly on top of the Search market. As for its other divisions, interoperability will allow efficiency between your products and services and yield an over-all better and more competitive product. I myself have been working on a venture, cellseek.mobi. However I am forced to use Google Adsense, as it is the only service that offers the services I need as a web publisher. Anything up coming in this area? Thank you for your time, and I hope that you at least read and consider my ideas. Purchased games only work if your console has connected to the Internet within the past 24 hours. You can’t trade in games to just any second-hand retailed; they have to be Microsoft approved. You can’t lend games to friends. Or maybe you can but only once, no one really seems to know. These restrictions seem ridiculous, but in the context of the rest of the market they unfortunately aren’t. The world seems to be moving from a model of owning something with the freedom to do what you want to it to a service you merely access. This restrictions of freedom of use for items you buy came into fashion through Apple and its’ iTunes store. Don’t believe me? Try and take a few songs you bought on iTunes and drag them over to your Android, Windows, or other device. With services like Netflix, Spotify and the rumored iRadio from Apple emerging onto the marketplace, you don’t actually own the content anymore. We just merely pay a recurring subscription model to access it. Even Adobe is getting into the act by offering cloud based subscription access to their Creative Suite as opposed to buying and downloading the whole product. Again, access over ownership freedom. The pressure to establish recurring revenue models is very prevalent in business today, and is something I’ve had to deal with in my startup. When it comes to the things you buy, I always feel that the user should have the freedom to do what they want with the content they purchase. Unfortunately this trend towards recurring subscriptions and heavily constrained content is quietly making this ideal a thing of the past at the consumers expense. This post could go on for ever as hypocrisy and politics go synonymous these days. However, I’m going to focus specifically on the case of diaster relief. With the current tragedy in Oklahoma being realized, undoubtedly relief money will be needed to help the victims rebuild. However, the two Senators from Oklahoma voted AGAINST relief for the victims of Hurricane Sandy, citing the need for a ‘balanced approach’ to the budget and demanding offsetting spending cuts. Let’s take a look at this hypocrisy. The two Senators in question are Jim Inhofe and Tom Coburn, both whom opposed the ~$60 billion aid package for the Northeast hit hard by Hurricane Sandy. They weren’t alone; 67 other members of Congress (all Republican) also voted against the bill. This has local implications as well. Currently, Tippecanoe County is applying for federal aid relief as a result of the damage caused by Aprils flooding in the area. Rep. Todd Rokita was another of the Republicans who voted against Hurricane Sandy relief, but now that his constituents are applying for federal relief will he change his tune? The euphoria over balancing the budget was out of control, and now these Oklahoma Senators might be required to face their past votes. We should hold them and all those who opposed Hurricane Sandy relief to it, and if they turn around with their hand out for federal aid, ask them why federal aid is okay for their constituents but not for anyone else. While you may or may not agree with the budget crusade undertaken by Republicans and Tea Party representatives, these ideals have no place in the face of disasters such as the Oklahoma tragedy. It should be doing about the right thing from a moral sense, not rhetoric and political points. Something extraordinary happened today. While much of corporate America’s efforts to avoid paying taxes has been kept out of the public eye, Apple CEO Tim Cook went before a Congressional Committee and not only seemed to accept the incredible figures related to his companies tax avoidance (Somewhere north of $100 billion stashed in Ireland where there is less than a 2% rate) but also sought to pressure US lawmakers into lowering the corporate tax rate here or else he’d continue the practice. I wrote a few months ago about the race to the bottom as far as subsidies for businesses, something which ironically Apple has received millions of dollars of tax payer dollars for while also orchestrating these tax avoidance schemes, and their affect on the US economy as well as social conditions for the people. Today reveals another very concerning trend that fits under the ‘race to the bottom’ category; the pursuit of corporate tax dollars by money starved governments has created a race to the bottom of tax rates. This is really discouraging for a few reasons. First and foremost, this race to the bottom starves government budgets of dollars used for social programs that we are now seeing cut due to the current sequester efforts. Incredibly, against this backdrop of ‘Tighten your belts’ for the working class, corporations continue to receive billions in subsidies while also using schemes to avoid billions in taxes. In the committee Q&A, Senator McCain mentioned that as much as $1 trillion in taxable earnings may be stashed off shore. With a budget deficit of around ~$650 billion, if this money were to be taxed according to the law we’d be in much better shape financially. Instead, we are slashing social security, medicare, medicaid, education, and research and development spending left and right – all with a tremendous social cost. Secondly, Cooks near arrogance at going in to this committee hearing and suggesting the United States should lower its corporate tax rate in to the single digits shows the ability for multinational corporations to apply pressure to governments. With a deal with the government of Ireland hatched in 1980, Apple can funnel money to it’s Irish subsidiary that pays less than 2% in corporate tax. While APple rightly points out that it is not the worst when it comes to tax avoidance, the idea that a corporation has the ability to ‘choose’ what taxes it will pay and what taxes it will avoid is just plain wrong and certainly something an individual can not get away with. This brings me to my third point. Corporations have for decades fought for the right to be granted individual rights, known as corporate ‘personhood.’ With the Citizens United decision in 2010, corporations could now express their ‘free speech’ right through unlimited campaign donations, significantly altering the campaign balance of power shifting it from people to these multinational corporation groups and very large donors. Now, ironically, corporations don’t want to pay a similar tax rate to the very people they’ve been trying to be equal with in a rights sense for decades. It seems to plainly be a desire to receive all the benefits of personhood without any of the responsibility; such fundamental responsibility as paying ones proper taxes. The tax situation in the United States is in a dire condition. As the United States has become more revenue starved, corporations have been able to manipulate and stretch the laws around the globe to avoid paying taxes and gain tremendous leverage over world governments. Without a common consensus among world governments to set some type of tax standard, corporations will be able to continue to use their considerable leverage to pressure various governments into lowering their corporate rates, leaving tax paying citizens holding the bag. The United States has turned into a welfare state, though not in the way you would typically think. Much of the welfare argument has to do with social spending on individuals through programs such as social security Medicare/Medicaid, food stamps, etc. However, a new type of welfare has grown over the past few decades that receives little attention; corporate welfare. So what is corporate welfare? Corporate welfare is any combination of money grants, tax subsidies or other favorable treatment of corporations by the government. Furthermore, and perhaps more explicitly, it is the guarantee of existence provided to institutions that are considered “too big to fail” as we saw in 2008. If a small mom and pop shop goes bankrupt, there isn’t a bailout waiting for them, they go out of business. This is not true for most of the largest and most profitable corporations in the world, who have been estimated to collectively receive around $125 billion in government aide annually. In fact, Facebook just recently paid $0 in state and federal income taxes while receiving a $429 million refund from the government, while other corporations such as General Electric have had years of $0 in taxes paid. Why are we subsidizing corporations like this? What does this mean for the U.S.? Increasingly, the work force is moving toward service sector jobs with lower wages while coveted manufacturing jobs are shifting toward countries with cheaper labor costs, with a recent study by Elliott Morss putting the figure at a 29 percent decline in manufacturing jobs since 1978. While the wages for most Americans have declined over the course of the past few decades, billions of the taxes those same individuals pay are going to the very corporations that are moving these jobs overseas. It’s a failed attempt to combat globalization and is seriously beginning to threaten the high standard of living we regard ourselves as having in what truly is the richest nation on earth. I don’t know the solution to the issue globalization presents our economy and I’m not going to pretend that I do. However, the fiery debate about social spending on individuals I believe is greatly misplaced. If we can afford to give corporations such as General Electric, Exxon Mobile, Facebook, and others billions in subsidies every year, then we should also be able to fund programs that ensure that kids across the United States don’t go to sleep hungry or wondering where their next meal will come from. Searching the Internet has historically been a bit of an awkward experience, where you have to guess the best combination of keywords to find what you’re looking for and it usually takes some time to get it right. Over the past few years, search using Google and Bing has tried to become smarter by trying to interpret the meaning behind your search phrases. For example, typing in ‘Capital of United States’ tells you the answer, a map, some basic information about Washington DC, as well as some points of interests, and then it lists relevant links. While this is a useful step forward, it still fails to understand the meaning of our searches and the relationships that we have that influence our search preferences. Facebook Graph Search is attempting to change that. Facebook is by far the largest site as far as usage in the world, having north of 1 billion users, most of which are very active. Facebook allows us to express our thoughts, share content with our friends, and define ourselves to our network of friends. This creates an exciting possibility for Facebook to analyze what we share about ourselves and with each other to then provide search results that are truly relevant to us. Questions such as ‘Restaurants my friends have been to in London,’ ‘Photos of my friends in New York,’ and ‘Cities my family has visited’ all are questions that this new Graph Search has the ability to answer. The possibilities for this are endless. I think the new Facebook Search project/feature announced yesterday, “Graph Search,” might be Google’s worst nightmare. Facebook has increasingly been the place where millions (perhaps over a billion) people share content back and forth. Additionally, the information we all provide Facebook creates an exciting opportunity to analyze relationships between people, their geography, and their interests. It’s the personalized relationship data that Google dreams of touching but is walled off from. Even though this was written in 1785, this is especially relevant especially given the attempts by Bobby Jindal of Louisiana to reduce corporate and personal income taxes to 0% and implement a larger sales tax instead. Just think about the advantages for higher income earners and disadvantages for lower income earners … a Warren Buffet or Bill Gates most likely wouldn’t be able to consume an equivalent percentage of income to that of a lower income earner, thus the regressive tax. Additionally, much of our technology advancements, infrastructure and research are publicly subsidized. Given that many of our wealthy such as Bill Gates gained most from utilizing these publicly subsidized technology, it should be that they are taxed a higher proportion that someone who hasn’t – and the same for corporations as well. These companies have gained from these publicly subsidized technologies, thus they should be paying their share into the system to create new technologies that can create new jobs for everyone. Jefferson knew this in 1785, it’s time we get back to this principal as a country and stop the war against government. Todd Rokita Voted Against Hurricane Sandy Relief? I was truly embarassed today to learn thay my representative in the House, Todd Rokita, was one of 67 House members, all Republican, to vote against, the $9.7b aid package to help with the recovery efforts after Hurricane Sandy. I find it unconscionable and reprehensible that someone could vote against disaster relief, but unfortunately it has become somewhat of a common theme with this brand of ‘fiscal conservative’ Republicans. are truly struggling, yet we are still playing politics. For the record, the relief bill was passed unanimously in the Senate. I can’t wait until 2020 when I’ll be eligible to run for office because I can’t stand this no compromise hardline ideological stance, and I can’t imagine many of those Representatives constituents can either. Using IntelliJ to Debug + Understand your Code.